A splendid evergreen foliage plant of medium to large size, adding an exotic jungle feel to any garden. Very large rounded glossy green leaves, with white flowers in bunches at the ends of the stems. Fantastic foliage makes this a wonderful specimen. Green foliage looks like it has been dusted in sugar at the edge of the leaf to provide a variegated frost effect. 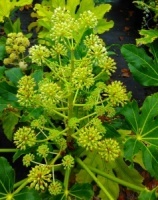 A rare and rather special form of the Castor oil plant. Originally from Taiwan, this evergreen species has large, serrated star shaped leaves that spring off a central trunk.